Fresh off a dominant performance in its most recent summer tournament, the U12G Matrix South Bay team is looking forward to the start of Presidio League play in September. Coach Hector Romo has his squad mixing impressive footwork and fundamentals with the tactical know-how necessary for player growth and development. The girls went undefeated in bracket play in the Riptide Summer Classic on the weekend of August 15-16. In the tournament final, the South Bay squad defeated San Diego SC 4-1 to take home the hardware. Congratulations to the players and coaches! 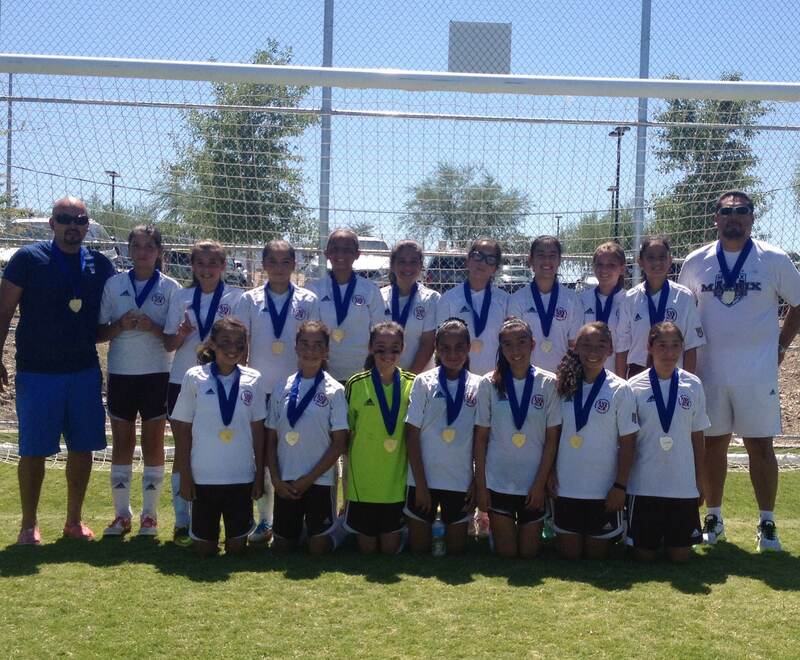 In the biggest summer tournament victory in our club program’s history, South Bay AYSO’s Under-13 Girls Matrix team won the Las Vegas Labor Day Classic by defeating the reigning Nevada State champions in the final 4-3. The South Bay girls stormed through bracket play to set up the championship showdown with FC Warriors (Las Vegas), which is ranked #21 in the Southwestern U.S. by GotSoccer. Coach Polo Aviles’ South Bay squad, known as Matrix Elite, has a high flying attack. Including the final, the girls scored 18 goals in four matches. The girls appear to be peaking at the right time, fresh off consecutive victories in the recent San Diego Development Academy (SDDA) College Showcase. 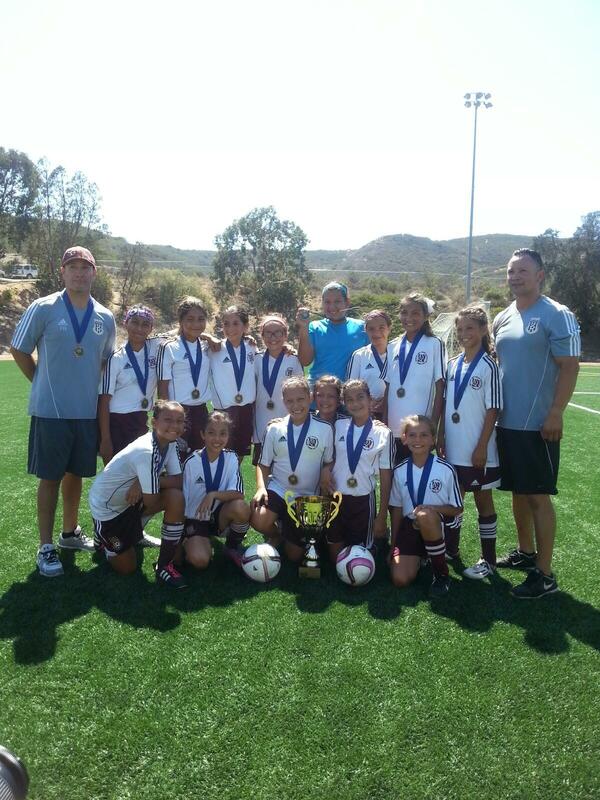 The team starts play on Sept. 6 in the SDDA’s Flight 2, as Matrix South Bay U13G Red. By any name, these girls are playing really well! 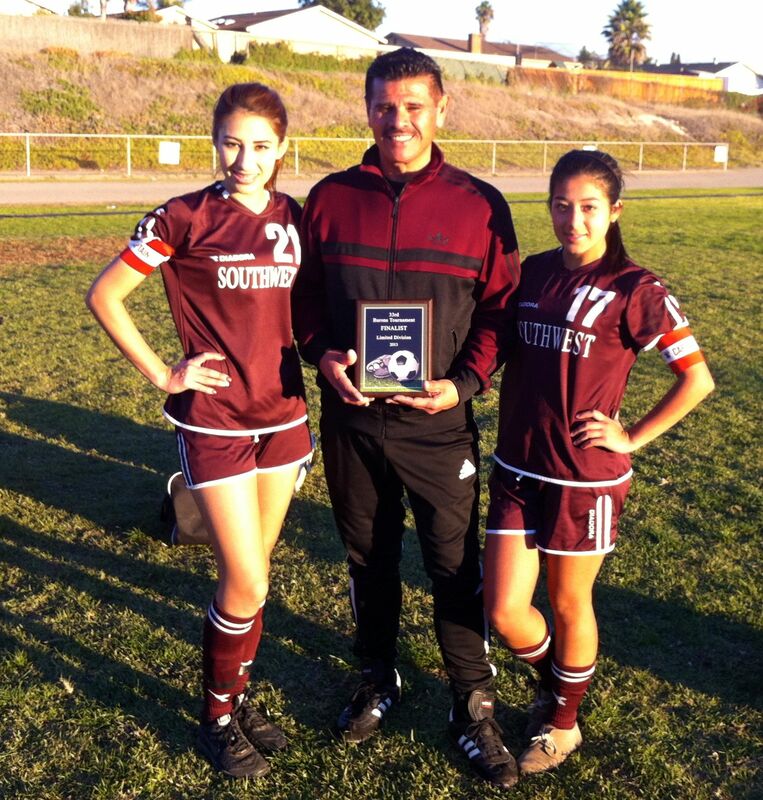 A shout out to South Bay AYSO Commissioner Marco Beltran, who also coaches the Southwest High Girls Varsity team. SOH is loaded with South Bay Matrix/South Bay AYSO players. The squad reached the finals of the Barons Tournament, losing a heartbreaker to Our Lady of Peace 3-2 after the fourth OT and with just seconds to go until a penalty shootout. The team captains for Coach Marco’s squad include Kimberly Avalos, left in photo, who played U19G South Bay recreational, and Juliana Campos, right, who played on the U19G SB Matrix team this fall. So much for the theory that you have to play on a high-priced club soccer team to make a high school team, much less captain the squad. SOH upended El Capitan High in the semis, and came back from two goals down in the final to send the match to overtime. OLP notched the game-winner on a corner kick right before time expired. The semis and final were played on December 14. This year’s Southwest High team had an infusion of talented freshmen from the U15G Matrix team coached by Hector Ordonez. Look for future updates about South Bay Matrix players who are now starring on Varsity squads across the South County, from Mar Vista High in Imperial Beach to Otay Ranch and Olympian high schools in eastern Chula Vista. Mar Vista High in particular boasts a high number of Matrix U19G players (Coach Santiago Villanueva). A South Bay Matrix team of combined U14 and U15 age players won the U16G division of the Rangers Thanksgiving Tournament last weekend. South Bay went undefeated in bracket play before winning the championship match vs. Nado’s U16 team in a dramatic penalty kick shootout 4-3. It was a 1-1 tie in regulation. South Bay’s Xanthie Ordonez hit the winning shot from the mark. It touched off an immediate celebration from a packed sideline. Supporters included players from the Lil Matrix U9g team, and parents and extended family, many of whom took the field to congratulate Ordonez, Goalkeeper Natalie Cassidy and teammates. South Bay had a balanced attack during the tournament, with goals coming from Jeny Tapia, Leslie Fonseca, Ordonez, Briana Romo, Berenice Portillo, and Andrea Mendez. In addition, Leah Delgado notched her first goal of the season–and that came during the tournament championship. Over the course of the season, the defense was anchored by Romo, Tapia, Gabriella Millican and especially Nicole Rea. Midfielder Nat ‘Jelly’ Morales created chances for her teammates throughout the year with stellar footwork. On the wings, Deavine Guijarro gave opposing teams fits. Angelica Lara was the most improved.